By law, the appointments must yield a "fair representation of the financial, agricultural, industrial, and commercial interests and geographical divisions of the country". As stipulated in the Banking Act of 1935, the Chair and Vice Chair of the Board are two of seven members of the Board of Governors who are appointed by the President from among the sitting Governors. The terms of the seven members of the Board span multiple presidential and congressional terms. Once a member of the Board of Governors is appointed by the president, he or she functions mostly independently. The Board is required to make an annual report of operations to the Speaker of the U.S. House of Representatives. It also supervises and regulates the operations of the Federal Reserve Banks, and the U.S. banking system in general. The Board obtains its funding from charges that it assesses on the Federal Reserve Banks, and not from the federal budget. Membership is by statute limited in term, and a member that has served for a full 14 year term is not eligible for reappointment. There are numerous occasions where an individual was appointed to serve the remainder of another member's uncompleted term, and has been reappointed to serve a full 14-year term. Since "upon the expiration of their terms of office, members of the Board shall continue to serve until their successors are appointed and have qualified", it is possible for a member to serve for significantly longer than a full term of 14 years. The law provides for the removal of a member of the Board by the President "for cause". All seven board members of the Federal Reserve Board of Governors and five Federal Reserve Bank presidents direct the open market operations that sets U.S. monetary policy through their membership in the Federal Open Market Committee (FOMC). Records of the Federal Reserve Board of Governors are found in the Record Group n. 82 at the National Archives of the United States. President Donald Trump had nominated Marvin Goodfriend and Nellie Liang to fill the remaining two vacancies. Mr. Goodfriend and Ms. Liang have had hearings but never received a Senate vote. Liang withdrew herself as a nominee on January 7, 2019, after months passed without the Republican-led Senate granting her a hearing. Trump then nominated Stephen Moore and, later, Herman Cain . Board of Governors meeting January 1, 1922. ^ a b c Federal Reserve (January 16, 2009). "Board of Governors FAQ". Federal Reserve. Archived from the original on January 17, 2009. Retrieved 2009-01-16. ^ a b c d See 12 U.S.C. § 242. ^ "The Three Key System Entities" (PDF). Board of Governors of the Federal Reserve System. ^ Richardson, Gary (February 2006). "Records of the Federal Reserve Board of Governors in Record Group 82 at the National Archives of the United States". Financial History Review: 12. doi:10.1017/S0968565006000084. Archived from the original on April 21, 2018. Retrieved April 21, 2018. ^ "FRB: Board Members". Federalreserve.gov. 2013-09-03. Retrieved 2014-01-11. ^ "Trump nominates economist Nellie Liang to fill the last Federal Reserve board seat". Washington Post. September 19, 2018. ^ Timiraos, Nick (7 January 2019). "Nellie Liang Withdraws From Consideration for Fed Board Seat". The Wall Street Journal. Retrieved 7 January 2019. ^ Timiraos, Nick (2019-03-22). "Trump Offers Fed Board Position to Economic Commentator Stephen Moore". Wall Street Journal. ISSN 0099-9660. Retrieved 2019-03-25. ^ Borak, Donna (2019-04-04). "Trump says he's recommending Herman Cain to Fed". CNN. Retrieved 2019-04-08. ^ "Preston Martin - Federal Reserve History". www.federalreservehistory.org. Retrieved 19 March 2018. 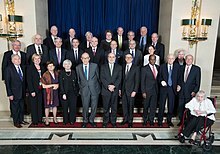 ^  Board of Governors of the Federal Reserve System. (n.d.). Board Members. 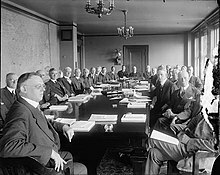 Wikimedia Commons has media related to Federal Reserve Board of Governors.